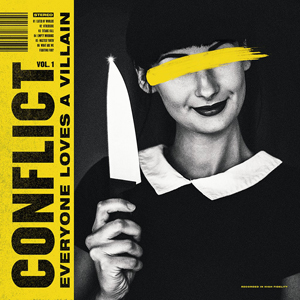 Cinematic hard rockers EVERYONE LOVES A VILLAIN have released the first single from its upcoming album Conflict, Vol. 1 on Spotify and Apple Music. The track is “Eater of Worlds” and is a blazing sample of an amazing band that seems to do everything right. ELAV is made up of the Pacific Northwest’s finest rock musicians and each member adds his own fuel to the fire the group creates. The official music video for “Eater of Worlds” was unleashed at the same time as the track and you can check it out now on KNAC.COM HERE. ELAV is lead guitarist George Silva (Eclipse recording artists FIVE FOOT THICK), guitarist Dylan Harris (LUCID), vocalist Chris McCoy (OCEANS DIVIDE), bassist Joel Hiatt and drummer Steve Ellis (THE FAIL SAFE PROJECT), and media manipulator Jimmy Hill (Amplified Wax Recording Studio). The group began organically out of an 18-year friendship shared by Silva, Harris, Ellis, and McCoy around the idea of a hard-hitting yet melodic new project featuring a diverse pool of talent. ELAV will release its debut record, Conflict, Vol. 1, during the Summer of 2018 and the set is the embodiment of that idea come to life. Songs like “Eater of Worlds” and “Empty Mirrors” mix power, precision, and politics in original ways and demand attention. The sound is unbreakable hard rock with a focus on high-level musicianship and ingenious songwriting. Comparisons to STARSET and BRING ME THE HORIZON have happened but only tell part of this story.